Take a look at Chancy's bandaid action, about 50 seconds into this video, after the hiccuping action. :) In this video I use the Squeak Method to help her moderate her teeth pressure. You can see her respond to me: She eases up, thinks about it, and then resumes more carefully. 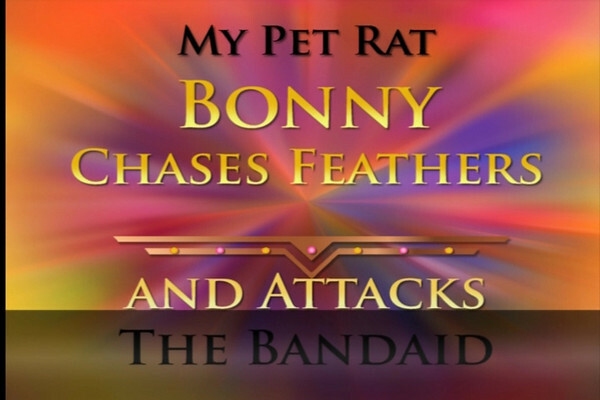 More about the Squeak Method below the video, and there's another video of Bonny with bandaid action at the bottom of this page. Rats have very low opinions about bandaids. Something in the plastic makes rats unhappy, and they will eagerly attempt to remove them from their human's skin. This can be a great enrichment activity. You may have to help the rat slow down a little and become attuned to how to bite the bandaid enthusiastically, without nipping into human skin. Some rats will naturally and automatically be careful. Some might be less aware. .
You can help in a couple of ways. One is to take a gentle hold of the rat's body, and if you sense she is chomping too hard, or headed that way, intervene by blocking her or pulling her slightly away. Then let her resume. And/or, you can utter little tiny rat-like objection squeaks. The "squeak method" as it's called, means you Squeak Just Like a Rat. The object isn't to yell a loud human squeak so as to frighten your rat, but instead to use the rat's real squeaking behavior to signal "Hey Me No Like That" and "Ouch!". Your rat doesn't want to hurt you, so if she can hear the right kind of squeak from you, she'll lighten up her teeth pressure. If you and your rat can enjoy bandaid enrichment, you can even get the big, 6-inch type, or apply 3-4 bandaids together, to make the Yanking just a smidgeon harder for the rat. Don't forget to help your rat succeed, if you need to, by pulling off the bandaid entirely. Many rats are quite intolerant of various plastics, and bandaid plastic is at the top of the list.